Ten curlers and four coaches attended the CCA's Development Camp in Thunder Bay the week before Christmas. Fort William Coach Dave Kawahara reports that it gave "quite a boost" to everyone attending. He was especially appreciative of the opportunity to hear the responses of people with the experience of Wendy Morgan, Daryl Neighbour and Laura Farres to the same questions that have been asked of the everyday coaches like himself. "The in-class sessions were very interactive and excellent questions and responses flowed. It was a very successful camp," he said. Four teams are expected to compete in the N. Ontario Provincials at the Fort William CC in Thunder Bay, February 25-27. Sudbury has formed a team of athletes with experience in other disciplines, who Wayne Ficek, reigning provincial champion, feels will be strong competitors once they gain more on-ice experience. 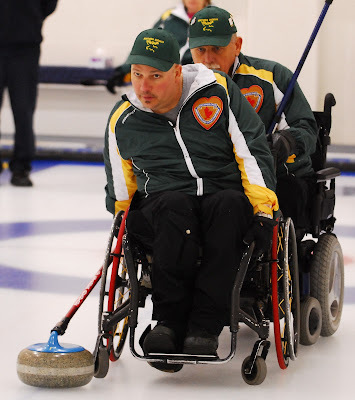 The title this year, though, is expected to be a contest between two-time champions Team Ficek representing Kenora (though two of the team live in Dryden) and Thunder Bay's Carl Levesque who skipped a selected N. Ontario team at the 2008 Nationals. Team Ficek, after claiming 4th place in 2009, went 3-6 last March. "As under achievers last year I expect if I can get back to the Nationals that only a play off position would be tolerable this year," Wayne told me today. Good Goal Wayne. Go for it hope you succeed no one plays for second spot. You have the skills and the TEAM just win the games.